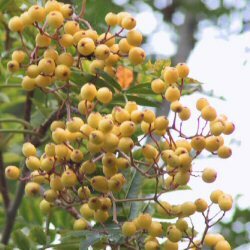 Joseph Rock (sorbus 'joseph rock') is a spectacular mountain ash because of its tiny, bright green leaflets that turn lovely shades of orange, purple and red in autumn. Groups of pearly white flowers develop in spring and are followed in autumn by beautiful small yellow berries, which are loved by birds. Joseph rock is able to withstand a wide range of soils and conditions. A small tree, so expect a height of up to 4m (13ft after 20 years. Supplied at a height of 150-200 cm tall in a 7-12 litre container.